The Diocese of Jerusalem includes Israel, Palestine, Jordan, Syria and Lebanon. The headquarters is in Jerusalem with St. George's Cathedral. The property contains a guesthouse, the bishop's home, the cathedral and a college where people can stay and take courses/tours on the Holy Land. The Reverend Dean Gregory Jenks of St. George's College Jerusalem gave me the privilege of working in the archives of the college & the Diocese of Jerusalem headquarters. My main task was to look for evidence of the original property boundaries from when the British acquired the land. I worked hard & found some fascinating things. Upon arrival, Azzam, the kind man that's head of housekeeping, told me that I was to live in the tower. I'd been to the college & cathedral several times & never realized that there are apartments in the hundred-year-old bell tower. I was to stay in the top one, with 66 winding stone steps to my front door. It’s a two-story apartment with a single gothic window on all 4 sides of the living room. My windows are the top single ones in the tower photo. No one had been in the archives for years. There are 2 sections. The first has about 375 books in Arabic, English, Hebrew, Armenian, Syriac, Coptic, French, German, Greek, Italian, Latin, Persian, Turkish & some unknown languages. Several are very old, with the oldest being from 1563. About half dated to 1800 & before, with most of those being in Latin. (Thank goodness for Google Translate!) They cover bibliography, biography, culture, geography, history, language, literature, music, religion, science, & travel. Some were gifts to the bishop. Some from libraries that closed. I cleaned & organized them, then made an Excel spreadsheet with tabs listed by publish date, language, author, category, etc. The second section has about 80 boxes containing hundreds of files that covered many years & several subjects. Some are the Anglican Bishopric in Jerusalem, Arab Evangelical Episcopal Community, Bishopric of Jordan, Lebanon & Syria, the Diocese of Jerusalem, Middle East Council of Churches, and Executive Secretary to the Vicar General. There were lots of records kept from the British Mandate period up to the 1980’s. Subjects include the Consecration of Church buildings, property transactions, claims for damaged properties, tenant correspondence, Cathedral plans, Gift of Episcopal Throne from Oxford England, General maintenance, Sharing a sports field with the YMCA nearby, Proposed road & widening road, School reopening 1948-50, Reconstruction 1948 & a church that closed in 1948 & reopened just recently, Property in other countries, Schools & hospitals. I had never thought about the details and administration involved when ownership or control of land changes as it did in 1948 and 1967 in Jerusalem. As Dean Greg said, there are some PhD‘s waiting to be found in these fascinating records! Some photos of the cathedral during Advent. The miracle of the swine in Matthew chapter 8 and Mark chapter 5 was considered Jesus' first miracle for non-Jews and therefore a very special event. A large Byzantine monastery complex was built on the east side of the Sea of Galilee, in Gadarene/Gerasene territory as in the gospels. Fast forward to 1948, when Jews started living in the area, which was then Syria. 4.5 miles south of the monastery & closer to the water, the Syrians kept the area mowed so combative Jews could not hide in the reeds & cause trouble. Two Jewish men surveyed the area & found 4 ancient things. One was a stone threshold for a door, another was a very long stone breakwater (longer than Caesarea Maritima), a large stone vessel (like a giant bathtub) & half of a round stone structure coming out of the ground on the waters edge. In 1967, Israel took over the region/Golan Heights & started letting the reeds grow, covering the 4 ancient items. Those 2 men never forgot what they'd seen & told their story about 5 years ago to an Israeli archeologist named Haim Cohen. Haim went to explore. The reeds were so thick that the only way he could get in was to crawl thru the tunnels in the reeds made by wild boars. (The swine are still there today!) He raised some funds & had the first season of digging in the autumn of 2015. At the end of that 6-week season, they discovered an inscription in tile near that stone door threshold. It was a tribute to someone, indicating that the building could have been a synagogue or church--more likely a church because a synagogue wouldn't be near swine. That inscription is at the Israel Museum today, not on display yet. I joined their dig for a short time. It cost about $500 per week that covered room & board. We stayed at En Gev kibbutz, one of the largest & oldest. I was happy to do this because archeology fascinates me & I hadn't spent much time with Jews in my Holy Land experiences. It's a lot of work to carefully dig down a couple of inches in a 2-foot square space. Made me really appreciate all the ancient sites I've visited & the amount of work done to show antiquity. I found several small mosaic tile pieces. After I left, they found a mosaic tile floor, in only 3 colors--white limestone, rust oxidized limestone & black olivine. That's a sign that it's early, i.e. first century, because it was before they started using blue, green, etc. In addition to a few other American & European volunteers, a local Jewish high school group bussed in as part of their class & a Chinese professor with about 8 undergrad & graduate level students (some of them never out of China before) worked there too. Here's a photo of some of the many coins that the Chinese prof & his team found in the half circle, which they decided was a pool to store fish for sale. In the photo with the dig sign (area is now called Kursi), you can see how the reeds were cut & smashed by a large bulldozer-type machine to facilitate our work, along with how close it is to the beautiful Sea of Galilee. Other photos are the door post w/2 American volunteers, the half circle pool, us cleaning pieces of pottery in sea water then setting them out to dry on screens in the sun, my room at the kibbutz & the mosaic floor as it was just emerging. Being in Bethlehem for Christmas was a dream for me. I booked 2 hotel rooms months in advance with the idea that some other hospital volunteers would want to join me, but no one did. The only hotel that had vacancies that far in advance was too far from Manger Square for me to be safe by myself. A few days before Christmas, I called the Manger Square Hotel (that's right beside the Church of the Nativity & where our 2014 pilgrim group stayed) on the chance that maybe there had been a cancellation. They had 1 room available---& it was less expensive than the first one I'd booked. Thanks be to God! Upon arrival in Bethlehem, my first stop was in the historic Church of the Nativity, where I saw 3 Moslem ladies exploring. I'd never seen any head-covered Moslems in a Christian Church. Then I met my friend Walter that has also been a SERVE volunteer in Nazareth. We ate dinner at Afteem, a Christian-owned falafel shop that's been there since 1948. It was really cold that night so I'm wearing a scarf in this photo trying to keep warm. Walter is a student at Bethlehem Bible College working on his masters degree in world peace. He's started a cottage business turning spent tear gas canisters into Christmas tree ornaments (www.peaceparcels.com). Christmas Eve day, lots of bagpipe & drum bands marched thru town. That must be leftover influence from the British Mandate era (1918-1948) upon this Arab population. They were great! Next, I visited the Shepherds Field. I'd been to the Evangelical Shepherds Field but wanted to see the Catholic Shepherds Field. Something else to share about is the Nigerians that one sees here. As I understand it, their gov't gives each citizen $800 to go on spiritual pilgrimage. Moslems go to Mecca & Christians go to the Holy Land. They're happy, soulful people that I always enjoy seeing. Here's a shot of a Nigerian group in the first Shepherds Field chapel. As I walked further into the field, there were more places for groups to worship. I could hear Christmas carols being sung by at least 4 different groups in 4 different languages. It was exciting & felt like the whole world was preparing to celebrate Christ's birth! The ruins of a large Byzantine Church were there. Among them was a staircase going down into the ground. I couldn't resist & went in. It was a cave. At the back was an altar, 3 benches & an electric light over them was on. I sat on one of the benches & opened into contemplative prayer. It occurred to me that Jesus was probably born in a cave & how comfortable the temperature would have been if there were some animals & other people there. I got a strong sense of how much God loves me & takes care of me. The next day, I bought a small, carved olive wood lamb to remind me of that special time. Here's a photo from inside. In going back to Manger Square in Bethlehem for Christmas Eve, I was struck by how much security they had. At least 2 men on every rooftop & a dozen or more police & army in every corner. The "place to be" is the midnight mass at St. Catherine's, the newer church next to the 3rd century Church of the Nativity. A free ticket is required & I was unable to get one...but I ended up having something better. The law of the land is that the leader of that area has to attend the service at St. Catherine's at least until just before Eucharist. The British leader attended during the Mandate period & Mahmoud Abbas attends now. There were barricades in Manger Square & guards around the church. I couldn't get thru from the side with the big, beautiful lit Christmas tree & large screen that the service is broadcast on, so I went around to the side. A uniformed guard told me Abbas was inside & said to wait across the street for 10 minutes. I said ok. That guard left & another came. His English wasn't great & I went on about "how many times would I get to be in Bethlehem for Christmas?!" He said, "Ok, but go quickly." I got closer to the door of St Catherine's & there was another barricade. A voice said, "Do you just want to go to the church?" I held my hand out & said "yes" loudly. He moved the barricade back & I got into the Church of the Nativity. My plan had been to use the side door to enter St Catherine's. I looked around & realized that it was empty. I could finally get a good look at the beautiful Byzantine floor without the crowds around. Then I though, "Wait a minute, where was Jesus born? I'll go to the Grotto!" I tiptoed down & there were about 15 or 20 people there, mostly monks & nuns, having Eucharist in Arabic. Wow that was special. That was my Christmas! Afterwards, I went to the courtyard where there's a nice statue of St Jerome, just in time to see the recession from St Catherine's. It was led by 2 men in what looked like Turkish uniforms (perhaps carried over from the Ottoman period) each holding a rod that they stamped on the ground in staccato unison. Then the thurifer, crucifer, priests, bishop, Costas, choir and many others. I crossed the street to my hotel room about 2 am & went to sleep with a warm heart & smile, feeling like God & I had such a special Christmas together in Bethlehem. There are just a few more things I'd like to share about the end of my time here this year. I attended an Israeli Philharmonic concert in Haifa. Andras Schiff was guest conductor & pianist that performed Bach. I sat next to an interesting Jewish lady who had moved here as a small child with her parents in 1948. The house lights were on during the whole concert (maybe for security?) and their applause were rhythmic & in unison. The quality of the performance was excellent. There's a Moslem Man that is a patient here in dialysis. When I was here in the summer, he would yell at the TV and gruffly asked the nurse in Arabic if I would massage his feet when I was working with a lady next to him. I hadn't planned to massage any men because of the traditional culture here but said I would. He had gross feet and toenails that were super dry. He would gasp in pain when I put on the lotion & started working on his feet, but he said it was good, that I should continue and he verbally said many blessings on me and my family while I was massaging. I didn't see him when I first got back in November because I worked on days that he wasn't here. My schedule changed & he was so excited to see me. He grabbed my hand and wanted to know how long I am here. I told him I would be with him as much as I could. I had things to do and it took me a while to see him. Whenever he would see me pass by his door, he would yell. When I finally got there, he opened up and started telling me about his family, how he's sad about the violence in the world, that his daughter works here in maternity, lots of things. I ended up not only massaging those old dry feet, but also both hands and even got behind his chair to work on pain he pointed out to me in his shoulders. Because he's usually crusty, most people here won't take much time with him. He's calling me his daughter now and I am honored. Here is a selfie that we took. I heard that the nurses thought we were funny. New Year's Eve is something else that they're good at celebrating. Jane that helps run the volunteer program invited me to her home. They hosted dinner for 20. We put about 5 bowls of each type of salad, grouped so each person could reach each type. It was Jane & her husband, their children, their children's spouses, the spouses' parents & siblings, a neighbor & me. They grilled 4 or 5 kinds of meat, served bread, drinks, dessert. I once again was blessed by the incredible warmth & hospitality of our beautiful Christian brothers & sisters in the Holy Land. I go home grateful. There's a big Christmas tree lighting celebration in front of the Greek Orthodox Church that was built over a well where Mary would draw water. The evening was an extravaganza with a stage, music groups, awards given to honorable citizens, a countdown (that started at 15 in Arabic), and then a great fireworks show when the tree was lit. I attended with some of the other hospital volunteers and it was a great time. The Nazareth Hospital has a Christmas bazaar. It's a little bit like the Holiday Faire that we have at St. Paul's but is smaller. I bought some lovely handmade goods. The hospital had a retreat day for the staff & we volunteers got to join them. A bus picked us up in the morning. On the way, we stopped for a manaquish breakfast---round, thicker flatbread with white cheese or zatar (a mixture of mostly thyme that they use a lot) & olive oil. It was especially good fresh & warm. The retreat day was held at Hamat Gadar, southeast of Nazareth, near the Sea of Galilee. They have hot springs pools where we soaked & swam, a clever bird show, a large area with crocodiles & alligators, a petting zoo, the ruins of a Byzantine Synagogue & peacocks roaming the grounds. What an adventure. Here are some photos. The first day we had a half-day art and history tour. The second day we had the monastery tour. This is a lovely convert that we started with on a beautiful Greek morning. The island of Patmos does not have an airport. To get there, we flew to the island of Kos and then took a ferry. Patmos is a beautiful island. Our Bible studies with Fr. Kamal were held on our hotel grounds. The monastery sits on a hill & was also a protective fort at times. Another very special spot on the island is the Monastery of Saint John. It dates back to the 11th century. Here is some of the ancient beauty from inside the main courtyard. The most holy place that we visited during this whole pilgrimage, to me, was the cave where St. John wrote Revelation. This is the view of what he would've looked at from near the cave. Our guide was Carolyn, from England, that has lived on the island for over 20 years. She recently converted to Greek orthodoxy so had a lot of information that she was passionate about to share with us. We were fortunate to know her. After our 3.5 days there, we took an overnight ferry back to Athens on our way to the airport.Our travel agent in Greece, John, met us at the ferry in Athens and took a selfie with us. He was great to work with & did a good job booking all the things that I could not. This trip exceeded my high expectations. Greece is a beautiful, hospitable country. Our people were spiritually focused, kind and generous with each other. This journey definitely deepened my faith and understanding of Saint Paul's writings. I am very grateful for this experience! We took a boat ride around Mt. Athos & visited the wonderful St. Demetrius Byzantine Church in Thessaloniki. Our dinner spot near Corinth had a lovely seaside view. We also visited Cenchreae, where St Paul had his hair cut off because of a vow (Acts 18:18), & the wonderful museum at Ancient Corinth. Here is our group by the Bema in ancient Corinth, where St Paul was brought for judgement. We had lunch at a great spot that overlooks the old city. Some of us hiked around Acrocorinth, including Alan Potter. Acrocorinth is a fortress on top of the mountain that overlooks ancient Corinth. It has ruins from the times of Ancient Greece to the medieval period & a beautiful sea view. We stopped at Corinth Canal on our way to Athens. Our distinguished music director, Wade Dingman, is here in front of the Parthenon. Our return trip to Athens included a visit to Mars Hill, on the Acropolis. This is where Saint Paul spoke about their altar to An Unknown God (Acts 17:23). The pulpit at our church has a stone from here w/an inscribed plaque on it. While here, our seminary student from Virginia, Bobbi, read that passage from Acts to us. Mars Hill is behind her. Our group photo is in front of the Caryatids, also on the Acropolis. While in Athens, we heard from a Greek Orthodox priest, Archbishop Nikiphoros, a friend of John Harriman's. Here he is with Fr. Kamal at our hotel. Lastly, we visited the wonderful Byzantine & Christian Museum. Faith & devotion are visible in their many beautiful works! Five members of our group left us to return home or travel elsewhere at this point. The rest of us went on to Patmos. I will send one more update about that next. The athlete in our group, Campbell Tasker, ran in the illustrious Psiloritis Mtn Race on Crete....and won! There's a beautiful chapel there, where Fr. Kamal spoke with us about "What have you done with your baptism?". On our 2nd day, we toured Delphi. There were so many temples to the pagan gods in close proximity. Being here gave us a good sense of the religious context of the time. The art is impressive too. We continue to love our Greek guide Rea. She's very knowledgeable & feeds the stray cats & dogs every chance she gets. All is well. Our flights were good. Hotel is nice. Food is great. Here's part of our group as we were leaving the Athens hotel yesterday. Today we had an introductory meeting with Fr. Kamal then met our Greek guide Rea for a trip to the Archeological Museum. It gave us a nice introduction to Greek culture & history, along with a good context to what St. Paul found here. After dinner, Fr. Kamal started teaching in more detail about who St. Paul was. These are acolytes at Christ Church, the Anglican Church in Nazareth that was started in 1871. The Arabic writing behind the altar is taken from Isaiah 61, quoted by Jesus in Luke 4, "The Spirit of the Lord is upon me..." when he taught in the synagogue in Nazareth. The current priest there is a young Arab named Fr. Nile, who gives insightful sermons & does part of the service in English if he sees a Western person in attendance. One of the Baptist churches in Nazareth. (There are at least 3.) It's a larger congregation. They also have a school. His PowerPoint is part Arabic/part English. They offer an earpiece w/English translation of the sermon...& have a rock band. St. George's Cathedral in Jerusalem, headquarters of the Diocese of Jerusalem. They have services in both Arabic & English...& a good organist. This is a Melchite church in Bethlehem on Christmas Eve. Lots of incense, chanting & bells. It was all in Arabic & I felt like I was with the original Christians. 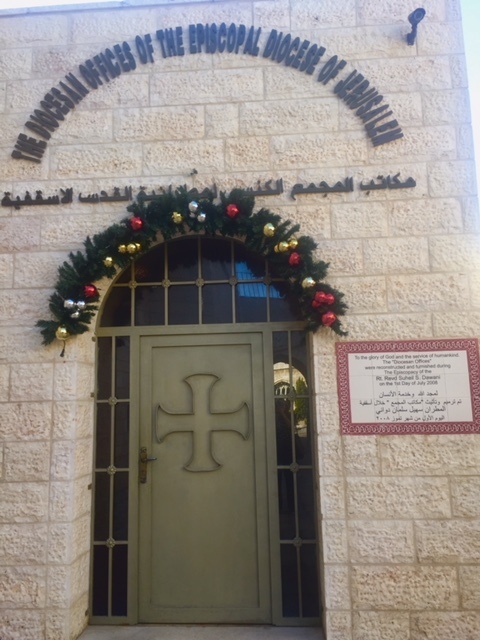 The Lutheran Christmas Church in Bethlehem on Christmas Eve. The service included a sermon by a learned visiting professor & some nice hymn singing. Lastly, I wasn't there but some friends attended a church (better not be specific) where a lady dressed in Moslem clothing took Eucharist. She's become a Christian but can't tell her family for fear of safety. I hear there's a wave of Moslems converting to Christianity. Please pray for them. It's great to be back at the Nazareth Hospital. This is the best spot that I know of in the world to hear many types of church bells regularly. Add the Moslem calls to prayer & it's a pretty amazing feast for the ears! One of the first things I did upon returning was walk part of The Jesus Trail with some people that were raising money for the SERVE program. The Jesus Trail is a 65 km hiking & pilgrimage route in Galilee from Nazareth to Capernaum that traces where Jesus may have walked & connects many sites from His life & ministry. On my way back to volunteer at the Nazareth Hospital, I spent a few days in Jerusalem. Here are some photos from my time there. Chagall Window in the synagogue at the Hadassah University Medical Center. Chagall made 12 windows, inspired by Jacob's blessings upon his 12 sons and Moses' blessings on the 12 tribes. This one is Judah. "Your brothers shall praise you, your hand shall be upon your enemies' necks..."
"Naphtali is a deer running free; he delivers words of beauty." This painting hangs at The Temple Institute in the Jewish Quarter of the Old City of Jerusalem. They have several paintings that show life in the 1st & 2nd temples; & display gold, silver & copper vessels that are ready for use in their planned 3rd temple. It's hard to believe that 6 weeks have already passed and I am headed back to Bellingham.The highlight of my time here has been the people. A chief reason for my visit has been to encourage and support the Christian population in the Holy Land, which is now down to 2%. I'd like to share a little bit of the life here in my last post. Family is huge here. Most people live in the same building with their extended family members. For example, grandparents are on the first floor, brother above with his family, then sister, uncle, etc. When someone has a baby or their child gets engaged, they bring special desserts to their co-workers to celebrate. Parents meet w/ parents of a potential spouse at the very beginning of a courtship to make sure all are compatible. There's little loneliness but also little privacy. Overall, their lives seem rich with family love and support. With the significance of families here, schools seem to be more a major employer and in the forefront of daily life. The Christian private schools have been operating here for hundreds of years and also educate Muslims and those of other religions. I found that people educated at the private Christian schools knew better English and seemed to have a superior education to those that attended the public schools. Right now something big is happening for them and they can use our prayers. The funding for the private schools comes partly from the Israeli government and partly from tuition paid by parents/families. The government funds the Jewish private school operations at 100%. The Christian school operation funds have been shrinking and are going to be at a record low (29%) this year. The government has also put a cap on how much tuition families can pay, squeezing the school budgets and threatening their existence. This unique land contains palm trees next to pine trees. Outside my flat are lime trees, grape vines, pomegranate trees, olive trees, rosemary, lavender, thyme/hyssop, ...seemingly wild and prolific even in the most dry and hot part of summer. My time was primarily with the Palestinian Christians whose main language is Arabic. Sometimes they turn to speak to me and forget to switch to English. They quickly realize it, apologize, and translate. Pretty amazing. Most people I know here speak at least 2 languages--some 4 or 5 (French, Russian, etc.). They answer the phone in English "hello," then converse in Arabic and end with "bye bye." The road signs are in 3 languages, Hebrew, Arabic and English. I enjoyed taking some Arabic lessons and having another bridge to my friends and coworkers. The photos are of how my milk comes in a plastic bag, a beautiful old arch I pass when walking downtown to the Basilica, the first fresh figs I've had, and examples of the buildings that are probably each occupied by a family with the different core family members on each floor. The last photo is a special farewell breakfast I had with Christine (in the middle) and Jane, the amazing ladies that run SERVE Nazareth. Christine is from England and Jane is from Nebraska. They wear many hats and do it all well, with kindness and a smile. I am grateful to them for the opportunity to be here and for taking such good care of me. The Nazareth Trust owns and operates the hospital, the nursing school, the SERVE program I'm working with, and a unique place called Nazareth Village. It is a carefully researched, very authentic re-creation of the first century Nazareth where Jesus grew up. People from all over the world visit and see living examples of life during these times and references from the Bible. A guide takes you thru the village and explains many biblical metaphors and stories used by Jesus. Such as how a new shoot will grow from the roots of an olive tree, even if it's cut down, and many new olive trees are planted this way (Isaiah 11, and note the meaning of Nazareth in my earlier blogpost). They also toss wheat in the air to show how it separates from chaff, you can see a working plough and yoke, sheep and goats (which really are different), a rich man's tomb, the four types of soil Jesus refers to, a carpenter shop, weaving, a synagogue and more. A first century lunch is often served that includes many more biblical references: red lentil soup (for which Esau sold his birthright), flatbread baked over a fire, zaa'tar (which includes hyssop, which was used to put blood over the door posts at Passover), hummus, labaneh, olives, cabbage salad and fruit. Here is a photo of Zack Miller and a donkey. Zack is from Virginia and works at the Baptist school here with YoungLife. He volunteers at the Village, is pretty fluent in Arabic after being here for just a year, and is a great part of this Christian community. Also shown are some sheep and the brown lambs (born here--it's really a farm), an olive tree and 2 other volunteers. The people here are like a family. It's been an honor to work with them and be warmly welcomed. There's no place on Earth like the old city in Jerusalem. I think it's the heart of the world. My time there was very blessed. I happened to be in the right place at the right time to see special services/chanting/incense/singing with Egyptian Copts, Catholic Franciscans, Ethiopians & Armenians. I started with prayer at the Western Wall. The first photo gives you a perspective of how close the Jewish holy site is to the Muslim Dome of the Rock/Temple Mount. The next photo gives a flavor of the shops in that area. That's followed by some art and a beautiful cross on the wall of a staircase in the ancient Ethiopian Monastery. The last photo is early morning light from the roof of the guesthouse where I stayed. It's on the Via Dolorosa, believed to be the route Jesus took with the cross to Calvary, which is now inside the Church of the Holy Sepulchre. The church is the 2 dark domes with crosses on top in the middle. I now return to Nazareth with a full and grateful heart. Azmi is the male RN in the 1st photo. My mnemonic to remember his name is "ask me." So I did, and he explained all about dialysis to me. The last photo is Dr. Mounir, Amer (a PhD research student) and Maha. She is the head of the dept. and is married to a man that teaches sports at the Anglican school. She is the mother of three children and is a grad student at the univ. in Haifa. The people I know here work very hard. I take notes to remember their names as a small way to encourage them. My duties are to help clean and prepare the stations between patients, to replenish supplies, and serve meals. I also talk with the English-speaking patients and lightly massage their very dry hands and feet with lotion. At first I only worked with the women patients in the unit, but some of the men were jealous and asked why, so I guess I'll be spending some time with them as well. The Tuesday group of patients includes a group of guys that talk loud and hold court in the ward. I discovered that most of them speak English, so we'll be talking about God, I hope, soon. I heard a great story the other day: The first time they met, our volunteer asked if they could pray for their patient as they massaged her. The patient said no. The volunteer kept massaging every week and at their last visit together, the patient asked if they would pray for her. God's love in action. Another ministry here at the hospital is a wonderful summer camp for the children of the hospital staff. This year they had 74 kids, so they needed all the help they could get. Their ages seemed to range from elementary school to the teenagers that led the activities. They were quite creative and did a lot for the kids on a small budget. The gentleman that led the children was quite gifted. I loved watching him tell stories because he was so animated. After the camp, he told the adults a story of how he had taught a prior camp group some songs with movements. Some time later, he was driving his car, and a group of those kids saw him, waved, and started doing the song and dance on the side of the road. That encouraged us that the campers might also remember some of the lessons they were taught about how God loves them and is there for them. The Basilica of the Annunciation is the spot where it is believed that the angel Gabriel announced to Mary that she would bear Jesus. It is some ancient ruins with a church built around and over them. It's partly ancient and partly modern---& it's quite beautiful. There are lovely mosaic Madonnas from all over the world inside and out. This is my 4th year in a row to visit, but my first year to go alone. Every time I've entered the basilica this year, it's been surprisingly powerful. The words that come to mind are presence, holiness, longing, reverence and hope. One of the many special things I get to do here is accompany the chaplains to speak with people about God and their faith. Yesterday I joined a gentleman named Simon that is from here and ministers full time. Having me with him enabled him to visit women - and we spoke to several, including Christians, Moslems, Druze and Jews. We started in the emergency room where they asked me to pray for some friends' mother that was very ill. Then we went to internal medicine, surgery and the psychiatric ward. We handed out booklets about Jesus that are available in Arabic, English, Hebrew or Russian. The patients seemed grateful. I got some hugs and even some chocolates. Simon's 47-year-old brother died suddenly of a heart attack 10 days ago. He shared that with a couple of the patients. One said, "Here you are visiting us when we should be visiting you." Things continue to go well. There's lots to do here and I am kept pretty busy - which I like. I'Il share more about my time and daily life soon. The history of how this hospital came to be is a story worth telling. It's foundations are based upon and continue to be in love for Christ and fellow man. Medical treatment here in the early 19th century was part folk remedies that worked & part procedures that didn't work & could even cause harm. The Ottoman Empire offered little healthcare and allowed local religious institutions to operate fairly freely. The American medical missionary, Peter Parker, served in China and traveled the world to raise funds and awareness. In 1941, he visited Edinburgh and inspired Dr. John Abercrombie to found the Edinburgh Medical Missionary Society (EMMS). Their aim was partly to "give intelligent proofs of the nature and practical operation of the spirit of love which, as the fruit of our holy religion, we desire to see diffused among all nations." In 1835, Pakradooni Kaloost Vartan was born in Constantinople to an Armenian embroiderer and his wife. Upon the death of his father, P.K. Vartan trained to become a translator. That training led him to work with the Turkish army in the Crimean War (which incidentally began as a dispute over holy sites in Palestine). Medical conditions were deplorable. Soldiers were left in their fighting clothes and most deaths were caused by hospital conditions rather than war wounds. This is where Florence Nightingale first improved sanitation and greatly reduced the death rate. Perhaps these conditions and her example inspired Vartan to study medicine. He chose the highly respected medical school in Edinburgh that was established in 1726. Initial funding came from the wealthy aunt of a British Army general. Upon her death, EMMS paid for him to complete his schooling in 1861. Following an invitation from the Anglican Episcopal Mission, he left for Nazareth. In December, 1861, he rented a house and immediately began work on "the diagnosis and treatment of disease and the dealing with patients on the concern of the soul." He was the first medical missionary for the EMMS and was assisted by the local Anglican priest. In spite of local resistance to new medicine and Evangelical missionaries, Vartan saw 15,000 patients during his first five years there. While on a fundraising trip to Britain, he married Mary Anne Stuart, a Scottish nurse. She was a fitting partner for his missionary and medical work. Immediately after their wedding, they left to serve in Nazareth. Their lives were not easy. Only five of their ten children survived. Mrs. Vartan helped create "a neat, fastidiously clean, well-aired house, with admirable contrivances for protecting patients from noise, and the glaring rays of the sun." By 1874, Vartan saw 50-60 outpatients daily, visited local villages on horseback twice/week and cared for 9-10 patients in the hospital that was also partly his home. He dreamed of building a proper hospital but had many financial and governmental obstacles. Eventually a location was secured largely with funds from a bazaar held in Edinburgh. In 1904, Dr. John Scrimgeour came to assist, and ultimately succeed Vartan. The "hospital on the hill" was taken over by Turkish authorities when they allied themselves with the Germans in WW1. The hospital administration was restored in 1919 but the building had suffered greatly. Scrimgeour launched a restoration fund and the new hospital was inaugurated in 1924. More building was completed in 1931 and electricity was installed in 1935. Patient numbers, building facilities and staff continued to increase. Like today, they served Christians, Moslems, Jews, and anyone without regard to religion. Nurse training had been part of the operations since early days. The mission hospital was recognized in 1919 under the British government mandate as one of the 13 hospitals for training nurses. Now, the "English Hospital," as it is called by locals, is the general hospital for the area. The parking lot is full. It thrives with all sorts of medical care and the support modern technology/quality standards require. The chaplain and new spiritual director both seem to be kept very busy. There's a pilot program coming where patients can privately listen to solar-powered devices for health care tips and the Bible. This place continues to work for the health of both the body and the spirit. Nazareth, in Galilee, on a hill overlooking the Jezreel Valley, is the town where Jesus grew up. My arrival and first few days have gone well. The driver from the airport treated me to a hot piece of flatbread filled with zatar for breakfast on the way. Then I received a warm welcome from Jane & Christine, the truly amazing women that run the SERVE Nazareth program. Since then, I've been getting settled, becoming familiar with how to get around, and helping out a bit. It's wonderful to be here. The name Nazareth may originate from the Hebrew "netser" - sprout, branch or shoot - or from the verb " lintsor" - to guard, to watch. The current population is approximately 82,000. Nazareth is the largest Arab city in Israel and considered the "capital of Galilee." Christians and Muslims live together here in relative unity and peace. By the way, the name Jesus (in Hebrew - Yeshua) is derived from the verb "lehoshia" - to save. Over the next few months, I will be spending time in Israel, at The Nazareth Hospital which is run by the Nazareth Trust, founded in 1861 by the Edinburgh Medical Missionary Society. The Nazareth Trust is unlike any other Christian Service. For over 150 years they have been 'Healing in the Name of Jesus' in Nazareth. What started as a humble clinic with 4 beds has grown to become Nazareth's General Hospital sitting high on 25 acres of Nazarene hillside they have owned since 1906. For 90 years their School of Nursing has offered an open doorway to all young people from the Nazareth area, preparing them for a life of service and care for others. I hope to spend the next months serving in the life of the community there through the SERVE Nazareth program. I will be working alongside local staff in a variety of areas in the Hospital, as well as in the community, supporting local churches and ministries. I will be posting reports from Nazareth here. Please pray for me and for this mission in Christ.